These never-worn flipflop sandals are by Ralph Lauren Collection and were made in Spain. 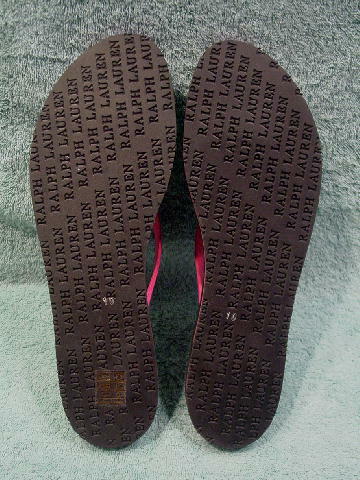 They have black rubber soles with Ralph Lauren in tone-on-tone etched letters all over. The black smooth rubber footbeds have a bright hot pink patent elongated egg shape accent with an etched Ralph Lauren Collection on it. They have shiny bright hot pink patent straps with gold-tone buckles and connectors. The style is called Fifi. They have a hot pink horizontal accent all the way around the side of the footbed. They come with their own gray shoe bag. She bought several pairs for a magazine photo shoot because she wasn't sure which would fit the model. She paid $98 plus tax on sale, and said the original price was $195 plus tax.